Could you tell us the story of Hodmedod’s? What is it, and how did it come about? We did a bit of desk-based research, that was myself, William Hudson and Nick Saltmarsh, on behalf of Transition City Norwich. We were actually working for an NGO called East Anglia Food Link, and we got really carried away with the work, and became fascinated by macro-nutrients, micro-nutrients, land use, what soil types there were around the city. Josiah with fellow Hodmedods cofounders, William Hudson and Nick Saltmarsh. The final conclusions were really quite straightforward. Norwich needed to recreate a kind of hinterland of horticultural production, which all cities used to have. Market gardens, effectively, supplying the city’s restaurants, shops, cafes, homes. It needed to re-engage with milling, and cereal production. Norwich at one point had mills all down the river, and they’re all closed. They’re all luxury flats, shopping centres, that kind of thing. It needed to reconnect with the arable land that would surround the horticultural land. And it would need to eat a lot less meat. The production of meat took up a lot of space, and had a huge environmental food print, and that couldn’t be sustained in this future model that we perceived, because Norwich and its hinterland would still have a responsibility to feed bigger, urban conurbations, so we’d need to make sure there was enough land to do that job. And it would need to become less dependent on synthetic fertilisers in particular, but synthetic inputs of all sorts, to reduce its fossil fuel requirements. In all of that, we still need to eat protein, and we still need to find nitrogen to fertilise the soil. And beans, which do both of those things, loomed into the picture and we saw that producing more leguminous crops, pulses, beans, peas, chickpeas, lentils, around the city, which are fixing nitrogen from the atmosphere and feeding the following crops, but also providing useful protein which could be eaten in the city, would be really important. We wrote this all up, and we presented it to Transition City Norwich, as a chapter in their action plan, and they were really taken with it, and asked us to actually help them implement some of those ideas. So we set up a small CSA, 9 acres on the edge of the city, working with about 150 families. We established a mill in the city centre, milling some of that cereal that was being grown in huge quantities but had no connection with Norwich anymore, in the city. Josiah and Martin Wolfe talking about the lentil trials at Wakelyns Agroforestry. We thought, “hang on a minute, we’re looking at farmers and thinking about asking them to grow beans, and they’re already growing beans that people are eating.” And we quickly discovered that the UK is growing around a quarter of a million tonnes of beans, which are all exported, mainly to North Africa and the Middle East, where they are a key part of traditional diets. It stopped us in our tracks, really. We knew, because we’d been working in food and farming for a long time, that field beans, which are a type of small broad bean, were very widely grown. We knew they were used in animal rations, but we hadn’t really thought to enquire about the extent to which they would be eaten, or traditionally have been eaten. And they’ve been grown here since the Iron Age. They’re one of the original crops of domestication from the Fertile Crescent. They’ve been found at Glastonbury, 1000 years, 2000 years, pre-Roman, they were eating these beans. So we began cooking with them, and they’re great. They’re really good to eat. We liked them. We approached various wholesalers and people that might help us market them, and they weren’t interested in doing that. We began to understand a bit more about the cultural history, the social history, that had led to them becoming stigmatised and not being eaten. This whole move to industrialised agriculture which happened a lot longer ago here than in the rest of the world. That change started 400 years ago, and we got rich, we learnt how to store meat and dairy over the winter, and if you needed to get protein from beans or peas, you were poor. And so they completely disappeared from the written record. Anyway, we realised that none of those stigmas really apply any more, but we’ve just fallen out of the habit of eating these beans, and we began by buying half a ton of split beans, peeled beans, that would have been going to Eygpt to make falafel. We put them in a little bag, and we worked with a local artist to create a postcard, an illustration of beans, with a recipe on it, and on the back it was postage paid, and we asked people what they thought. Would they eat them again? Had they ever come across them? Initially we weren’t hopeful, although we’d enjoyed eating them, and we packed a tonne up and spread them wide around Norwich, and at the Transition Network conference. And the postcards just started to come back. Initially there was a trickle, and then it was a stream, and then there were hundreds of them coming back. And people were astonished. They were really amazed that here was this crop being grown around the city, in which they lived, that they’d driven past, that they’d seen being harvested, that they walked through, and it had never occurred to them to eat it. They couldn’t believe that they hadn’t, and that no-one had done this. The response was overwhelmingly positive, and we realised that this was something that we needed to take further, and tell the story, and encourage more people to try this crop that we could already grow. We didn’t need to spend years trying out how to grow chickpeas, when we had a bean that we could grow and eat, on our farms already. Why the name Hodmedod’s? And what is Hodmedod’s now? The Norwich Resilient Food project actually finished in 2012. The CSA continues. The mill is still based with a baker in Norwich, and because we couldn’t find a partner to take on the bean element, and because we were so excited by beans, we decided that we – Nick, William and I – would do that work. Initially just with four products, whole and split beans, marrowfat peas and carlin peas, which are very traditional in the north of England, but again, tragically overlooked. We chose the name Hodmedod because, like the beans and peas, it’s a forgotten word. It’s a dialect word from East Anglia which means hedgehog, or snail, and we wanted to see that being revived, and to have that local, cultural character of the thing emphasised in the name. We just began with those four beans and peas, really, and it was part-time, and it wasn’t until 2014 really that we had enough momentum to take on our own warehouse space, but also to begin really very directly engaging with farmers. Instead of buying what they might have sold for export, or to animal feed, we were now at volumes where we could ask them to grow specific varieties in specific ways. One of the first things that we did was begin organic production of those beans and peas, which hadn’t been happening for at least 15 years because Canadian imports were so much cheaper, particularly of peas, split yellow and green peas, that farmers who made the effort to produce a pea that was good enough for human consumption, would find that they were undercut when the big ship arrived at Plymouth or wherever, Portsmouth, or wherever it comes into, full of cheap Canadian peas. By offering a farmer a price, and working out what his cost of production was, and being able to say if you meet the quality specification, which farmers would always have to do anyway, then we will pay this price come harvest. That allowed them to feel confident about making the investment and the effort to grow and dry the peas for human consumption rather than just for animal feed. So we began by doing that, and then we realised that there were a whole host of other crops – combinable crops as they’re known, crops that you harvest with a combine harvester that dry in the field – that we could be growing here. And that we could massively increase the diversity of crop production on UK farms. Hugely increase the diversity of the foods that we’re eating, these carbohydrate and protein crops that form the core of our diets. We’re all increasingly aware of where our meat, dairy and vegetables come from, but there are these anonymous crops. The rice that’s under your curry. Where’s the flour come for that pasta? Who’s made that? Where are your oats from? Who processed them? They’re questions that even the most sort of ethical consumers don’t often actually ask. We wanted to ask those questions, and we wanted to get people thinking about which ship did that come in on, and which country was it grown on? How were those people treated? Can we do something about the social, economic and environmental impact of this food stuff? The process of getting British people, for whom a field bean is something that’s an animal food, and it’s kind of war food – every culture has its thing it doesn’t eat anymore, whether it’s sweet chestnuts in Italy, or whatever – fundamentally, what you’re doing, or what you’ve done, is to get people to imagine those things in a different way. There’s an imagination piece there for me, that you’ve done really beautifully, about how you market that, with the watercolours and the recipes, and how you’ve taken something that people thought, “You feed it to pigs” to thinking, “Oh, yum, great, what will we make with that?” Can you tell me a little bit about how you’ve done that? I think we’ve done that from the start by being very clear about the history of the bean, and the stigma that’s associated with it, and making that part of the thing that makes it exciting. Eating this bean, you are, in some way… it’s transgressive. You’ve decided to take something that is stigmatised, and make it part of your diet. I think that’s quite exciting, and it’s a story to tell. Do people do dinner parties anymore? I don’t know. But this idea of talking about what food you’ve got, people like that. They like to say, ”Look at these beans, and here’s the story” and by being very clear about what the story was, and giving that story to people to then retell to their friends, is a really powerful way of just propagating an idea about something. So we did that. Making it beautiful was really important. The aesthetics of it. Some beans are really beautiful. Field beans are not perhaps the most beautiful of bean but packing them in such a way as they’re really attractive, people want to pick them up and they want to look at them. And then when they begin to engage with the story of them, they want to eat them and experiment with them. People were very interested in that, and we could show them recipes. We could take photographs, use social media, use websites, to encourage people to think a bit differently about those ingredients. They’re not just the kind of pottage, or gruel, or whatever you might want to do. There’s a whole host of really exotic and exciting things that can be made with this rather humble ingredient. That helps. But it’s the story of it that really hooks people in. They’re fascinated by it. There are 3 or 4 categories of people that have been particularly engaged. There’s the people that are very interested in food that horrendously I call foodies, which is a really nasty word. People that are really interested in food, and want to try new things. They’re quite experimental, and they would be keen to try the beans, and to try the recipes that we’re introducing them to. Then there are the environmental motivations for eating the beans. So there are a lot of people that were initially encouraged to eat them because they saw them as part of the future, a more resilient, less intensive future, and that they were a good choice for that diet. So they’ve made that choice. Which was less about the beans themselves, and more about the impact of the beans. Then what’s happened in the last 3 or 4 years is the rise of the plant based diet, veganism, vegetarianism, the consumption of less meat. Those people have no preconceptions about the beans. It’s almost as if that moment has passed, and they’re just interested in them as another ingredient that they can add, and they are increasingly understanding the global impact of commodity food production. So what is the impact of soya production in South America? How much land area are we using to feed livestock in the UK, or to produce soya curd, or milk, or whatever. And some of that initial research that we’d done for the Norwich Resilient Food project, which demonstrated really clearly, and I know you did this in Totnes as well, Britain can feed itself. There’s not an issue there. It’s just does it want to? Increasingly, people do seem to want to engage with that. Initially, it was all word of mouth. We didn’t have a presence. We’d talk to a room full of people, 50 people, and you give them all some beans to take away, and you’ve got 50 evangelists for your beans who are going to tell their friends. That multiplier effect is rapid. Surprisingly rapid. When you open up this possibility and say, “Hey look, the beans from here, and try them, and see what they’re like”, how have you seen it influence other people’s imaginations of what they think is possible? When we started we were the only people doing this kind of thing, certainly with legumes. It’s made a lot of farmers realise that there is this opportunity to do things completely differently. To completely rethink the supply chain that they have been stuck in, which is we grow a commodity, we fill up a bulker, a big lorry with 29 tonnes of that commodity, and it goes to a place, probably goes to a ship, and then who knows. To really think about how they can take those crops, that would otherwise just leave the farm, and who knows, and really start to think about where they might end up. Other projects have started as a consequence. We were really interested in runner beans. They’re delicious, and in most of the rest of the world, they don’t eat runner beans like we eat them, as green beans, they eat much nicer, softer beans for green beans, but we have trouble growing them. They use them as a dry bean. In Greece they have Gigantes, the giant beans that you get in tomato sauce and things, that’s a runner bean. It’s a completely different family of bean to the beans that we’re normally eating. So we found farmers that are growing runner beans for the supermarkets. And we went to them, one in particular in South Suffolk, and said, “What are you doing with your beans at the end of the year?” And he said, “Oh, I just strip them off the poles and that’s it, we chuck them on the compost bin.” I said, “Well, what about all of the beans that are still in the pods? Have you considered hulling them, and then we’ll buy them?” And he’d not ever even considered eating them. He thought they were poisonous! So he made some houmous from them at home, and could not believe that he’d been composting for 20 years, this delicious bean, that it had never occurred to him to eat. We bought some of those beans from him over the next couple of years. But now, he’s setting up a business to make a bean houmous, out of his special beans. Which is never going to make him a millionaire, but it is going to cover the cost of that end of season cleaning and preparing the land for the next year. It’s a really potential marginal gain that he’s made in his farm system. So there’s those sorts of smaller initiatives. But then there are bigger impacts as well. So bigger businesses than ours, bigger food businesses, are now looking at these UK based products, and thinking much more seriously about using them as ingredients in their foods. So our beans, but also other beans, that are grown in the UK, are now cropping up in products on supermarket shelves, which was never really something that we anticipated. It was the kind of broader change that we wanted, but it does represent this kind of normalisation of the fava bean. You have to create this narrative. You have to get it into cookery books. That was one of the first things that we tried to do, is engage with food writers and bloggers, to sort of normalise the idea of using this bean. Once it’s in a recipe book, people can open up the recipe book and say, “Well, I need fava beans”, you know. I don’t have to think about whether or not they’re poor people’s food. This recipe says that’s what we’re going to find, and so they go and look for them. And so it’s incremental, but there is a big change afoot with bean production. Hodmedods winning Best Food Producer at the BBC Good Food Awards in September 2017. Where could it go? You started back in Norwich in the context of a 20 year vision for Norwich. Where does what you’ve learnt now from doing this for the last 5, 6, 7 years, where does it take you now in terms of your imagining of where food and farming in this country could be in 20 years’ time? It takes us in every different direction every day, because there’s always something new that we’re thinking about. But our broader vision is for a completely new approach to farming in the UK, completely re-thinking on-farm rotations. Looking at crops that benefit the following crop, so much like the peas or beans are fixing nitrogen which can benefit the cereal, we can also grow crops which have a straw that can be bringing up P and K.
Crops like buckwheat are very good at scavenging minerals from the soil, which then can be returned to the following crop, but also can suppress weeds. Our broader idea is to create this whole new rotation, which has a high return to the farm, both economically, so it’s worth the farmer doing it, but also agro-ecologically it’s a more sufficient system. It’s a more robust system. And by demonstrating that there’s a demand for those products, those crops, we can encourage farmers to make the shift to growing them. Back in our East Anglia Food Link days, when we wanted to change the food system – we’ve always wanted to change the food system – we would go to farmers and say, “This is what you need to be doing. That’s what we’ve decided. We’ve got a spreadsheet. It’s all there, off you go.” And they would say, “Well yeah, that looks great on paper, but who’s going to buy these crops?” And we never were able to answer that question. We tried working with local authorities, with public procurement, and it was always very challenging to actually create the demand that was required to soak up the huge amount of production capacity that there is in the UK. If you drive through East Anglia, or travel on the train through East Anglia, the fields, there are a lot of them. They’re very big, and they’re full of crops that are going into feed mills, and going into Chorleywood bread process plants, and if we’re going to change the way that we farm those fields, which I think, and Nick and William also think, we have to, that needs to be a process of co-production. We need to work on the demand. We need people to understand what’s happening in those fields now. And what could happen. There’s massive uncertainty because of Brexit, which could be really, really positive. If we start to really think about where our food comes from, and if Brexit makes us do that, that could be fantastic. We currently pay landowners about 50 million quid a week in farm subsidies, when they’re supposed to produce some public goods from that. They’re supposed to guarantee food supply and they’re supposed to do whatever it is that they do to protect soil and biodiversity; we could be asking a lot more of them for that 50 million quid. And we could really create something quite fantastic. We could do all sorts of progressive things around land ownership as well. But you know, there’s a huge opportunity at the moment, to rethink all of this. That is a really good question. One of the things that people do when they visit the countryside is to think it’s a completely static place. It’s always been like that, it will always be like that. It’s a bucolic vision of this rustic idea, which is quite modern, really, in lots of respects. I would like people to go out and see it as a completely blank canvas. The hills do not need to look the way they do, the fields do not need to. What could we be growing there? People say you can’t. Just try it. I think it’s the same with the whole rural food production milieu. Just to completely begin. Local authorities could be doing that process. They can do it very actively through their procurement, and they can make choices, even within current EU legislation that’s all possible. They can begin to think about land use and planning. We can make some very simple changes that would free up land for much more innovative production. And looking at mechanisms to decouple land and value. There’s a real problem that the price of land per acre, even for agricultural land, is no reflection of the rentable value of that land, in that you cannot produce enough value on that field, to effectively pay the interest cost on purchasing the land. I mean it’s a mad situation where just the existence of the land has a value that’s far higher than any productive value of it. Which either encourages people to really sweat the asset, by working it too hard, or just do nothing, and not use their imagination, because they don’t need to. They can just wait for it to double in value in 10 years’ time. That’s a real block on our creative thinking about what’s happening. On the other hand, we engage with farmers every day, and they’re incredible. And they’re doing amazing things. And they are just waiting… Some of the things we might think, “Oh, I don’t know if I’d do that”, some of them are very progressive and innovative. They farm because they love farming. And they are just waiting to be given permission in some cases to develop this new system. We could do a lot more to encourage that to happen. Monoculture is the bane of food production. Both monoculture in terms of the quality of the food that we’re eating, which is very uniform and because of the supply chain it has to be uniform, because every sandwich has to be the same as the sandwich you had before, or whatever it happens to be that you’re eating. On the industrial estate which I visited this morning to see Grown in Totnes, and all of the businesses that are on that industrial estate, that plot of land, and they are cooking things, and making things, and working together, and cooperating, and collaborating to build a local economy. Much like a High Street does, but much more in a making way, we could do that with our farms. There’s a huge potential, not to build industrial estates on them, but to have lots of different enterprises making use of that land resource. So your beekeeper can be operating hives which benefits the orchard producer who’s using their windfalls to help a pig enterprise. There’s all sorts of possibilities, by breaking away from looking at a single yield – which is say, wheat or barley, that requires one person with two machines, a tractor with some attachments, and then a combine, to harvest and sell – we could create so many more jobs, so many more opportunities and have a much more vibrant rural economy as a consequence. I think, yeah, there are definitely opportunities emerging from this kind of thing. Any last thoughts on imagination and food? Fewer and fewer people are cooking at home. More and more people are eating food to go. That’s a real pity. People are often very nervous about experimenting with food. Either with growing it themselves or with cooking it. They’ll follow a recipe book. We get phone calls from people who say, “Your recipe says 450ml of water. I’ve put a bit more in.” “Oh, that’s fine.” The recipe is really just a set of guidelines. You don’t have to follow it. Put in some different herbs, do something different. If people are cooking at home, and being creative at home, then it leaves them to think more creatively about where that food is coming from. I hope that we can encourage more people to take raw ingredients, dried beans and pulses, which on the face of it are quite challenging, and to think about how they might prepare them at home. We get sent recipes. We get sent so many recipes every week for things that people have done, that we had never imagined. Someone phoning up and saying, “I’ve made tempeh with your fava beans. It’s the best tempeh I’ve ever tried.” Or, you know, “Have you tried sprouting and fermenting?” And they’re doing all these things and sending us pictures and telling us what they’re doing. So you’ve built a community around it? Yeah, people who are growing things in their own gardens and saying, “Oh, I’ve grown tiger nuts. Have you tried growing tiger nuts?” So we grew tiger nuts this year just to see. And you’ve grown quinoa as well? Yes. That’s working with a farmer who had a fantastic vision and imagination. He was given some quinoa from South America in the late 70s, early 80s, and he saw immediately this was a fantastically nutritious, delicious food stuff. And there was no reason why it wouldn’t grow in the UK, so he began growing it. But no-one quite shared his vision at that time. This is in the mid 80s by this point. He’s got fantastic news clippings of where he’d gone to trade shows and things with his South American superfood. Not that they used the word superfood, and it just didn’t happen. Partly because it had a saponin seed coating which needed to be polished off. But it just wasn’t ready. But he didn’t stop thinking about the quinoa. We’ve been growing lentils. 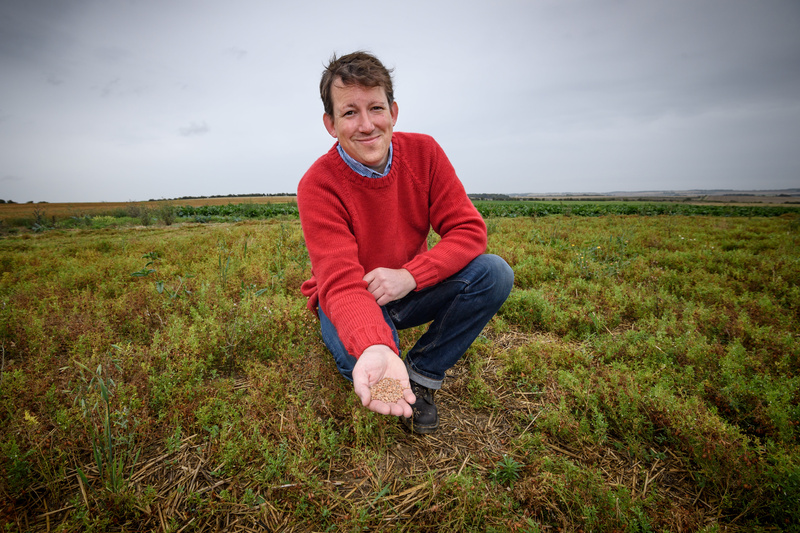 We got some press coverage earlier this autumn when we harvested and as a consequence of that, were contacted by a semi-retired professor from Reading University, Richard Ellis, who’d done a lot of trial work with lentils in the late 90s, and was desperate for them to be commercialised, but hadn’t managed to find the right partner. Now he’s helping us to look at the agronomics of lentil production and refine our processes. Sharing ideas, I think, inspires other people to share them back, and then you can have a creative process where we all learn and develop things. We’re very open and we’re not interested in intellectual property. We’re interested in everyone taking these ideas and doing something with them. 60 million people to feed, we don’t want to take over the world with Hodmedod! We want a business that’s sufficient that pays our wage, pays the wage of the people that we employ, allows us to do all the things that we enjoy, but there’s still a huge opportunity for lots of other businesses operating all over the UK, like Grown in Totnes, to flourish in the same way. So yeah, it’s exciting. Wonderful, thank you very much. What a brilliant article it tackles perception, imagination, R economy, local food production, creativity, and why not get this marvellous products, like falallef introduced in restaurants and schools AND beans are fixing CO2, brilliant ! These articles just keep getting better and better Rob. I had no idea at all that Hodmedod’s originally spawned from a Transition project. Totally inspirational. It reads like a survival manual for the Sustain-Age. Wonderful pulsating (sorry…) interview. Bean based meals are my favourite. It boggles my mind that most of the population won’t eat them regularly. With the approaches, people and imagination discussed here, maybe that will start to change in a significant way.